Julie Dirksen is from Usable Learning and is an instructional designer. Julie is focusing on using game design in the learning environment, but emphasises that this doesn’t have to be designing whole games. This really interested me as I know I’m not going to make some immersive video game for my learning, but I’m interested in taking the concepts behind this and what can be put into the classroom. My brother works in the computer games industry and most of his life revolves around consoles, PCs and games, so I’m well aware of that level of interest! Julie started with highlighting about the “gamer stare” that I’m sure we’ve all witnessed from kids/friends/family or been pointed out about ourselves. That gormless look when someone is concentrating completely on the game they are playing. 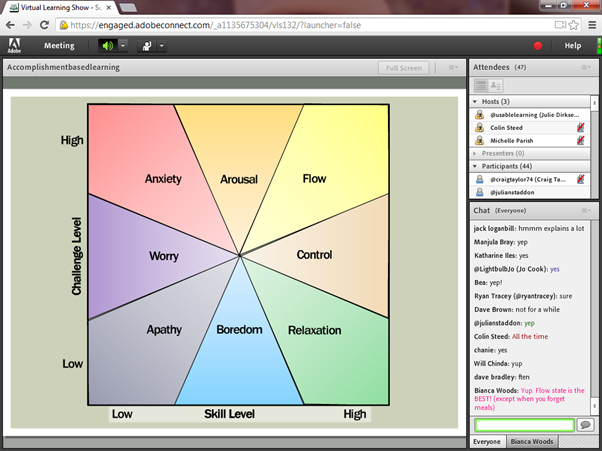 Julie highlighted that “with games learning is the drug” and the way to achieve that is with “attention, flow and structure”. With attention, Julie highlighted that our attention span can be quite low and if we are forcing our learners to pay attention we are lucky to get 7-10 minutes from them. However Julie also highlighted the Optimal Experience research by Mihaly Csikszentmihalyi, where we are really focused on what we are doing and time flies by. This happens when we are challenged within our skill level. 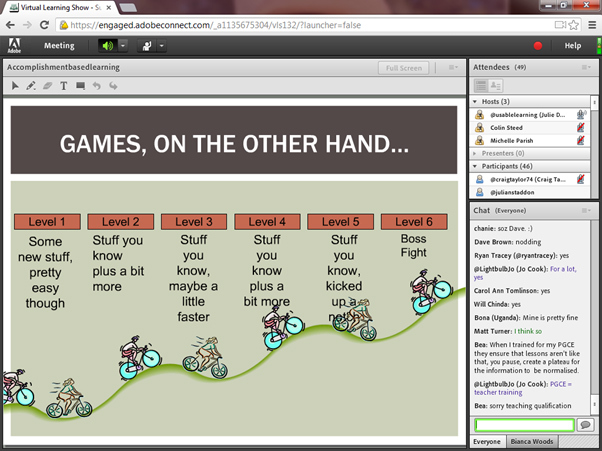 I really liked Julie’s analogy of feeling like you are cycling uphill when you are learning something new versus the feeling of free wheeling down hill when you are using something you already know. 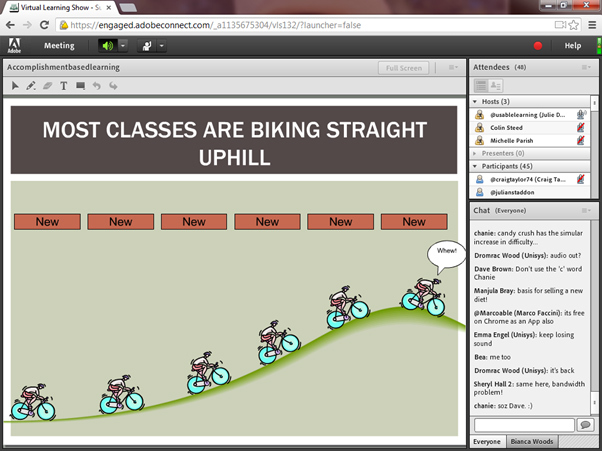 Julie then had two great slides where she explained that a lot of traditional classes are like constantly cycling uphill with more and more new things to learn. Then Julie suggested that using a game model for classes start easy, add more information, speed up the process and so on to the end challenge. I really liked Julie’s point about WIIFM (what’s in it for me?) is important for learners, but what about thinking about WCIDWT (what can I do with that? ), back on the job. Julie also spent some time talking about how goals are important in the classroom and accomplishments shouldn’t just be “completed module 4” but more like “I crushed the quarterly sales target”. A really interesting look at games and learning without having to design the next Tetris, Monopoly or whatever your favourite is!